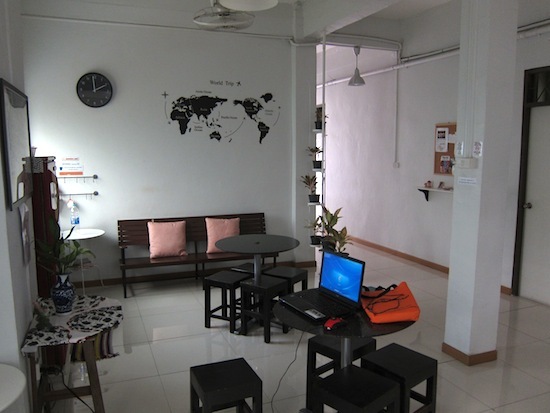 All four of the old Lee guesthouses have consolidated their efforts into Lee Travel Inn, a quality backpacker option in an unusually quiet slice of the Soi Ngam Dupli area. After renovations in recent years, the squeaky clean guesthouse is one of the best (and only) options if you’re after a dirt-cheap private room in the Silom/Sathorn area. Formerly known as Lee Guesthouse 4. While most of the budget beds in this part of town now come in the form of trendy dorms, Lee has stuck to its old-school backpacker reputation by offering basic private rooms in the 280 to 600 baht range. 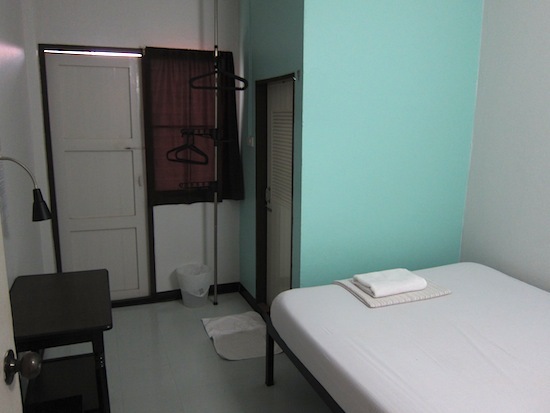 For the same price as (or even less than) one of those dorm beds at HQ, Lub d or one of the Silom area’s many other hostels, here you can have a small but well care-for room all to yourself. Reached by a narrow stairway, rooms come in four different types and are available with air-con or wall-mounted fan. Basic single and double rooms rely on a couple of shared cold-water bathrooms located on each floor — the lone sink is located out in the hall so you’ll probably have to brush your teeth in view of other guests and the cleaners. Most rooms come with a firm bed, clean linens, a tiny desk with reading lamp, a clothes rack and at least one small window. “Standard” and “balcony” editions are similar, but with the addition of a tiny attached bathroom equipped with a cold-water showerhead placed right above the bucket-flush toilet — there’s not enough space to put it anywhere else. We’re talking seriously cramped quarters in these private bathrooms. Balcony editions come with small balconies (surprise!) and a little extra space. With blank walls and utilitarian tile floors, all rooms are designed for nothing more than sleeping. Guests can hang out on a spacious outdoor veranda or in a common room with a few tables next to the reception desk on the ground floor. Extras include free WiFi, a shared cable TV, coin-op laundry and lockers. The young woman who greeted us was straightforward but friendly enough, and she didn’t hesitate to show us a few of the rooms. The entire building appeared immaculate, which is unusual for a dirt-cheap guesthouse of this kind. The rates listed here were labelled as “promotion” when we last stopped by. “Standard” rates are about 50 baht higher, but we’d be surprised if they actually charge the full rates any time soon. 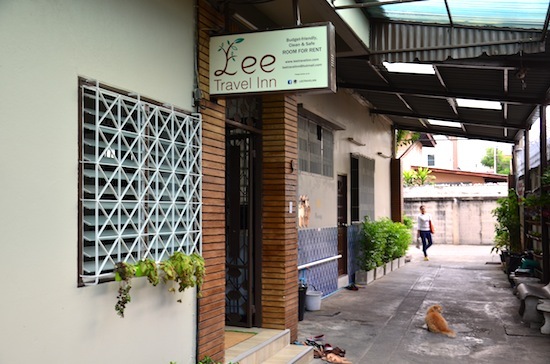 Lee Travel Inn is similar to At Home and other budget guesthouses in the Khao San Road area, but it struck us as the cleanest and most professional of the few genuinely budget spots that are still hanging on around Soi Ngam Dupli. The location down a little side-lane off Soi Saphan Khu puts several restaurants and bars (the infamous Wong’s is around the corner) within easy walking distance while also ensuring a relatively quiet night — at least until your neighbour comes back from the bar, as walls are on the thin side. This area has a slightly seedy feel in a few of the bars, but it’s far from an all-out red-light district. Lumpini MRT station is a 10-minute walk away, while Lumpini Park is also within easy reach. For roughly the same price, the nearby Moon House has four dim air-con rooms with floors and walls made entirely of purple and green tiles — the one we checked out looked a little grimy but offered more space than at Lee. Pop over to Madam Guesthouse, just around the corner from Lee, if you’re after a cheaper fan room with more of a homestay vibe. If you have a bit more to spend on a private room and you like this immediate area, consider S1 Hostel, Penguin House or Malaysia Hotel. Plus 40 baht for balcony room. Room: Sgl fan private bathroom, low season: 320 baht, high season 320 baht. Notes: Plus 40 baht for balcony room.